After being on hiatus for the last two weeks because of the Olympics the Penguins pick up right where they left off. I mean, they're back to their winning ways. Yeah, they went 2-1-3 in their last 6 before the break. If not for the OT loss to Washington...um, I digress. This game was all about regrouping the five Olympians back with their fellow flock. Fleury sat out after playing every single game in Vancouver, and Sid suited up and put out an effort after getting nearly no ice time against the rest of the world. For the Sabres, Ryan Miller decided his emotions might get the best of him when seeing Crosby skate around the Mellon with the a Gold medal around his neck, so he sat out. As such, it was a battle of the back ups. The beginning of the game provided much entertainment despite very few shots on goal for each team. Buffalo brews a very entertaining style of hockey to begin with so it was no surprise when we kept seeing both sides up and down. Though it was the Penguins who started off early with the majority of puck possession. And with that they tallied the first goal as well. After Tim Kennedy decided it was okay to hit another player (Talbot) while they are on their knees, Gonchar made him pay for his stupidity notching his 200th goal of his career. Quick thought on the powerplay: Just let Gonch fire off 3-5 shots every time till the end of the year and our percentage will go up from 16.5% to 19.2%. After that we didn't see another goal until Fedotenko lined up a laser to Dupuis. Yes, you're reading that correctly. At the 3:13 mark Feds made a nice dish over to Pascal to chip it past Lalime, who, as Errey pointed out, should have played the puck via poke-check. He should never have let a pass like that go in front of him. Nevertheless, 2-0 Pens. Lydman felt the need to get Buffalo back in the game and scored some 3 minutes later. Back and forth after that. Heading into the third Fedotenko wrists a sweet one past Lalime off a face off win and ultimately get the game winner for the Pens. After further review, Derek Roy did put the pressure on by scoring late in the third, but it wasn't enough. 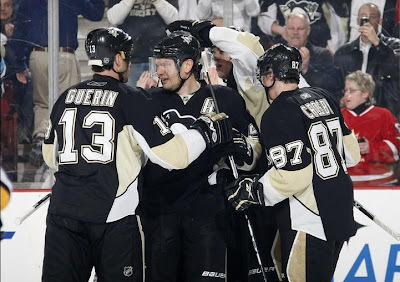 Pens win 3-2 by holding on near the end, good way to start the last 20+ games left in the season. Crosby shouldn't have played for sure. He logged 17+ minutes but you could just tell he was tired. And with 3 more games till Sunday, yeah. Malkin looked okay, got rocked in the head at one point, hope that doesn't have any collateral damage. Leopold looked good for his first game, though out of sync. Totally expected that. Time will tell, though I'm optimistic. Alex Ponikarovsky is on his way to help out the Pens here in the final stretch and through the playoffs. Reports say Skoula and Caputi will bring Poni over to Pittsburgh. Letang needs to practice shooting, that's all I'm saying. Keep up the strong forecheck as we head into Thursday against the Rangers.